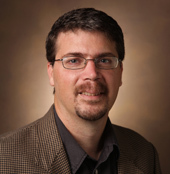 Sean Davies, Ph.D., associate professor of Pharmacology, was recognized as Pharmacology “Teacher of the Year” during the 25th Annual Joel G. Hardman Student-Invited Pharmacology Forum in Light Hall. Davies, assistant director of Graduate Studies for the Department of Pharmacology, was honored for his “interactive and engaging lectures,” and for co-teaching a course in Scientific Communications that aims to help graduate students improve their presentation and writing skills. “Dr. Davies is clearly passionate and committed to graduate education,” said graduate student Nicole Fisher, who announced the award. This year’s forum, named for the former chair of Pharmacology (1975-1990), featured national speakers on the psychopharmacology of psychedelic drugs. Vanderbilt speakers included Joey Barnett, Ph.D., acting chair of the department; Elaine Sanders-Bush, Ph.D., professor of Pharmacology, emerita; and incoming Pharmacology chair J. David Sweatt, Ph.D.